By growing your own potatoes, you can enjoy all kinds of tasty varieties — in numerous shapes and colors — that you aren't likely to find in any grocery store. Potatoes are easy to grow, but they prefer cool weather so you should try to get them into the ground at the right time. 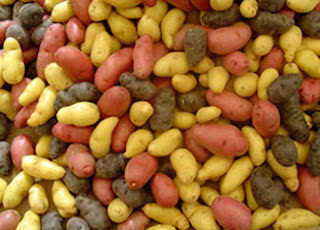 You can order seed potatoes through mail-order garden companies or buy them at local garden centers or hardware stores. (You could use supermarket potatoes, but be aware they have probably been treated with chemicals to inhibit sprouting, so they may not grow well.) Store your seed potatoes in the refrigerator. Your next step is to determine the recommended planting time for your climate. Since it takes potatoes two to three weeks to emerge from the ground, the earliest you should plant seed potatoes is two weeks before your last anticipated freeze date of 28 degrees Fahrenheit or lower. (If you don't know your local last freeze date, you can find it here.) About a week before your planting-out date, bring the seed out of the fridge and place it in a bright warm window for about a week. This will help break the spuds' dormancy and assure they will grow quickly when you put them into the still-cool spring soil. If you garden in areas that have hot summers be sure to plant your potatoes early, and to play it safe, choose varieties that mature in early- or mid-season. This is because potatoes do not do well when the temperatures climb into the 90s. They may actually keel over and die when the temperature gets to 95 degrees. If a late planting or a late season variety runs into that hot weather while the tubers are in the early bulking stage you may get a very low yield. To save work, or as a way to start a new garden bed, some people like to just toss their potato seed pieces onto bare ground or even a patch of sod, and then cover the pieces with a heavy mulch of straw or leaves. I've always wondered if you get as many potatoes with this short-cut method as you would if you buried the seed in a prepared garden bed, so I asked Jim and Megan Gerritsen, who grow and sell certified organic potatoes at Wood Prairie Farm in Bridgewater, Maine, what they think of this technique. The Gerritsens have been advising gardeners all across the continent since 1976. Q: Does planting potatoes in a deep mulch on uncultivated ground still give reasonably good yields? A: This deep mulch potato planting technique is called the Stout method, named after the old-time popular organic gardener Ruth Stout. Over the years Ruth had created beautiful soil and that fertile soil was a big factor in her success. Perform the Stout method on great soil and expect great yields of delicious potatoes. But try the technique on old worn out and unimproved ground and get ready to learn some patience and gain some humility. Potatoes are heavy feeders and they will respond dramatically to good fertility and tilth. Your yield will suffer to the extent that the soil you plant in lacks proper fertility and water. Thatch is a layer of organic matter that lies underneath the top green layer of the lawn. 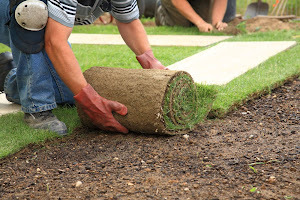 In Warm Season Lawns, thatch is comprised of living and dead runners (stolons), as well as other build up of organic material such as lawn clippings, and other organic plant matter which is in the process of breaking down. Thatch in Cool Season Lawns is an assortment of dead or dying leaf matter, lawn clippings, and other organic material. A layer of thatch is vitally important to the ongoing health of a quality lawn. It provides insulation to the lawn's root system, preventing evaporation of water and any drying out or dying of the lawn's roots. The thatch is what provides the softness to lawns under foot, that makes them so functional as play or relaxation areas. And a healthy thatch layer is part of the lawn that helps to prevent damage occurring by providing a thick knitted layer of runners, or thick tillering that work together to create a cushioning protection for the lawn. Even with the best lawn care, over time, thatch can build up to excessive levels, this can be for many reasons, either by natural course, or through being sped up by bad lawn practices such as infrequent mowing. Once excessive thatch is present, it must be dealt with, otherwise many problems will start occurring. Mowing will become more difficult, and each mowing will constantly cut back into the thatch layer, removing all the green leaf, and revealing the brown thatch layer. Lawns become ugly from the constant straw like undergrowth being revealed. With the removal of all the green leaf, Photosynthesis stops, and the lawn begins to suffer and starve from lack of food. Lawns such as Buffalo can be at risk of extreme thatching, where the lawn continues to grow higher and higher above the ground. At the base of the thick layer is the original lawn, long since dead, and the entire lawn is now comprised of a mixture of living and dead stolons and roots. 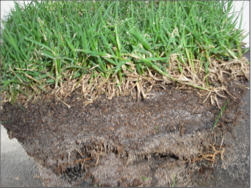 Eventually, as the lawn continues to grow and regenerate, new roots will no longer reach into the soil, they will stay in the underlying dead lawn matter, at high risk of dehydration, starvation from lack of nutrients, and death. The only remedy to a severely thatched up lawn is to remove the thatch. For Cool Season Grasses, this is best achieved by carefully reducing the mowing height over a few cuts with a Rotary Mower to remove any loose material. Then returning heights back to a healthy and normal level. De-thatching, and scarifying, and is essential in the lawn care regimes of all warm season lawns.